Thanks for the 411 on these. 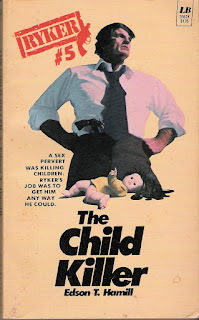 I'm finding it difficult to find much information on this paperback genre, and, like trashy movies, I think there is some interesting history involved in their creation and distribution. I'm surprised there was any interest in reissuing this books as recently as ten years ago, though this must only have been to exploit Nelson DeMille's name (I happen to like many of his more recent novels, even if they are overly macho). The Ryker/Blaze novels are quite bad, though I guess I read them so you don't have to! "The Slasher" by Edson T Hamill, a Ryker series' book? "Ryker" appears in the cover.